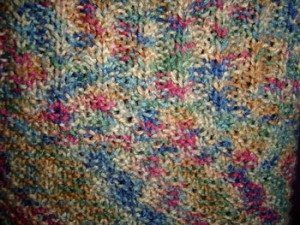 Should I quilt or should I knit? Which one wins out? Depends on if I need to get some hand work done. Right now I don’t have an applique project going, so I fall back on knitting. Have never crocheted, tried it, but had issues with that hook! Feel more confident using two needles, seems more balanced. That is the trouble with quilting/piecing, it is mostly done on the machine and that isn’t portable, well it is, but you know what I mean. Of course, I could hand piece, like a friend of mine, who does not own a sewing machine, and I have done that, but not in the mood to get that all set up. On our trip to San Antonio TX, I knitted all of the way there and back. Finished one vest and started another. I guess I will have some good “in-vest-ments” for next winter! Adding them to the others that I finished at the end of last summer, and showed you in my blog about being busy, busy, busy. Still haven’t mastered the kitchener stitch for the shoulders. Really have to work on that. 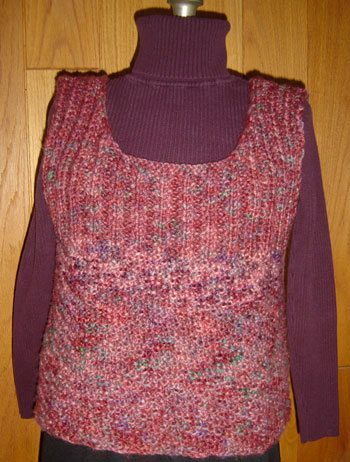 These vests have all been knitted in the round, because I don’t like sewing knitted seams. Trying to find stitches for knitting in the round is not easy, because 90% of stitches are designed to be knitted back and forth, right and wrong sides. 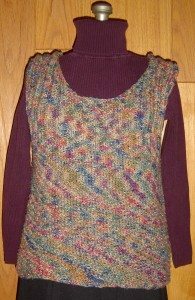 Both vests use the same stitch for the body and the upper portion. 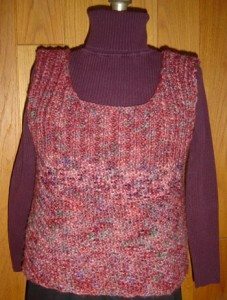 They just look different, because one has been knitted in the round and the other back and forth, to allow for the armholes. The stitch is called Rib Stitch Gone Wrong. You need a multiple of 4 plus 3 stitches, then *K2, P2,* repeat and then end with K2, P1. On the wrong side, repeat, *K2, P2,* repeat and then end with K2, P1. When it knitted in the round, with that P1, the pattern ends up creating a diagonal design. Let it snow and it did!